"People love to give all the credit to the stallions... But you show me any successful horse breeding program that has endured over the years, and I'll show you a program that is built around broodmares"
We believe the stallion puts a lot of the physical into the mix, abilities and looks. We picked Why's line and Smoky Cream color for both of these. We believe the mares put attitude into the mix. All our mares are kind, gentle and willing. They want to please and keep on trying. 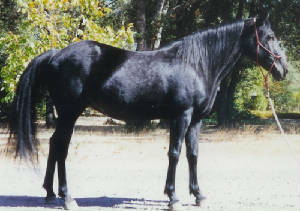 Our dream is to raise using horses that are easy to look at and easy to ride. We hope we are on the right track. We've bought some, sold some and have the girls shuffled around so that the whole herd consists of only mares with a big hearted mindset. They all have that special attitude we are looking for. BECAUSE OF THE DOWN-TURN IN THE HORSE INDUSTRY, WE FEEL THAT THE RESPONSIBLE THING TO DO IS CUT WAY BACK ON BREEDING YOUNG HORSES FOR SALE, SO HAVE HAD TO SELL OFF SOME OF THE MARES THAT WE WOULD HAVE RATHER KEPT. Feb. 2011 - We are no longer breeding at all. Most of the mares are gone. We still have a couple of favorites here to ride. 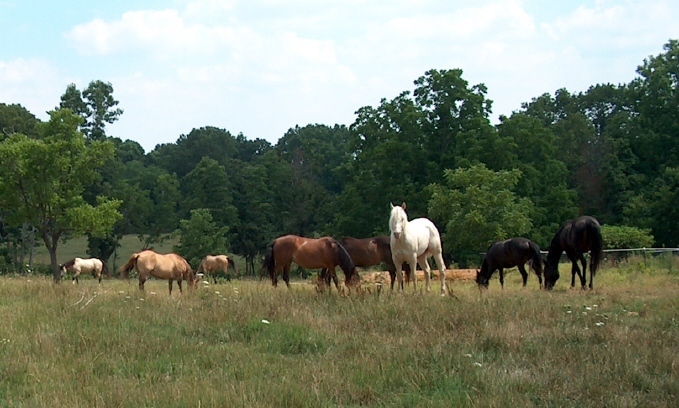 Click any of the mare photos to see a full size version. "Princess Turkey" aka Glory "So named because she is the favorite of the grandkids". She is gaited, has a nice body and a cute face with big soft eyes. Wonderful feet. Super gentle and well broke. Sweet attitude. 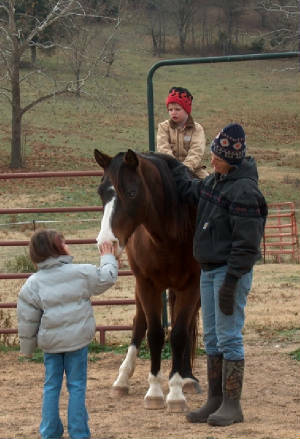 A trusted riding horse for both adults and the kids and visitors. She's one of those horses that, once you have her, you can't imagine how you got along without her. She'll be the very last horse we have on the farm. Glory passed on in Dec. 2010, I just can't take her picture down, she still lives in my heart..
Lady Sashay Our very first foal, now grown into a gentle, sensible mare with four excellent foals of her own. She is APBHR registered and is a TW/TB cross. She goes back to Merry Go Boy and Jet Pilot & War Admiral. She can run fast and forever. A great Gymkhanna horse, and a head down, well broke trail horse. Sold to our daughter, stays here on the farm. 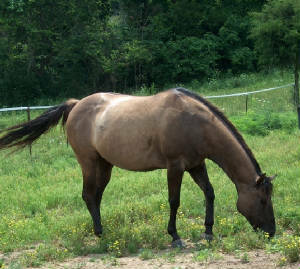 Lucks Moon Dial is a real nice old AQHA Grulla mare. She has one of the most comfortable shuffling trots we've ever had the pleasure to ride. Her lope is smooth also. She is gentle and very steady out on the trail. She is cinchy, but that is a past training issue. Almost anyone can ride her, she's real broke. She'll live out her life right here. -Update- she has passed on August of 2013.